Belgium’s top clubs have been struck down by crop circle circle style markings on their hockey pitches. Royal Leopold’s pitch was photographed after a recent deluge of rain with huge mushroom rings across its outfield. 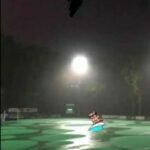 The strange images occurred last weekend during club training when heavy rain showers fell and air bubbles seemed to create the mushroom-style rings. “In a few minutes, the ground 1 was submerged under water; more than four centimetres,” according to a report on okey.be. “And then gradually came some green rings, mostly round. Which disappeared under a new rain. Meanwhile, KHC Dragons seemed to have the same water-based problem after an image was posted on social media by Tommy Willems, left. The website called it “an unexplained phenomenon”. Air bubble pockets seem to be the likely explanation, as opposed to a case of ‘fairy rings’, the scourge of groundsman attending to grass pitches. There are several types of the disease which can be caused by dozens of different fungi, with a release of excess nitrogen causing the circle ‘phenomenon’.